So sorry I missed posting this yesterday as I usually do. You know...sometimes, life just happens, right?! Anyhow, I have a super simple recipe to share with you today. In fact, it is so simple, that I'm not even going to link you to another page for the recipe. I'm just going to put it here on the page for you! Once again, the crescent roll takes center stage here. The trickiest part of this recipe is getting the crescent rolls into the muffin cups. I mean you thought putting something round into a square peg was difficult, wait until you try to put something triangular into a circle! For me, the easiest thing to do was to take a 2" biscuit cutter and cut a circle out of the wide part of the "crescent triangle" and put that in the bottom of the muffin cup (sprayed lightly) and then I used the rest of the dough to kinda build a wall around the edges and then used my fingers to seal it all together. It's a bit tricky so you may just have to experiment until you find a technique that works for you! The easy part however, is the filling! Just put it all together and viola...a light and easy dinner ready in under 30 minutes. When I made this, I only used one package of crescent rolls. I could have easily used two packages because I had plenty of filling leftover. 1. Simply prepare your favorite enchilada filling. 2. 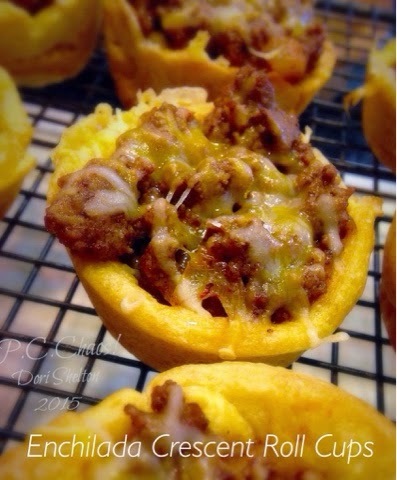 Heat your oven to 375 and pre-bake your prepared crescent roll cups for 8 minutes. If they puff up, which they more than likely will...take a fork and just "poke" them down a little. 4. Put them back in the oven for another 5-7 minutes or until crescent cups are golden brown and the cheese on top has melted.